Sometimes things don't quite go as planned. Let me explain. These Frankensteins have been swimming around in my head for the last month. I had a vague idea what I was going to use to make them, but it wasn't until I sat down in front of them, surrounded by marshmallows and candy, did I realize maybe I hadn't thought these little guys all the way through. After a bit of trial and error (and a dozen marshmallows tossed to the wayside), I finally figured out the trick to making them. And make them I did. Soon I was surrounded by a small, bite-sized Frankenstein army. It wasn't until I sat back to admire my handiwork that I noticed something was off. My Frankensteins didn't look quite right. Yet, I couldn't place my finger on what exactly was wrong. After a quick google search, I was stunned to learn my poor Frankensteins were anatomically incorrect. For some reason, I always assumed the bolt went through Frankenstein's head. Perhaps I'm imagining that only a monster could function with a block of metal through his brain and basing my logic from there. Every time I see a picture of him with the bolt in his neck, there is shock all over again. Apparently I didn't watch enough of The Munsters growing up. So, today I present to you an anatomically incorrect Halloween treat. I think that makes them scarier. Or Frankensteins with pigtails. Now that's the stuff of horror films. 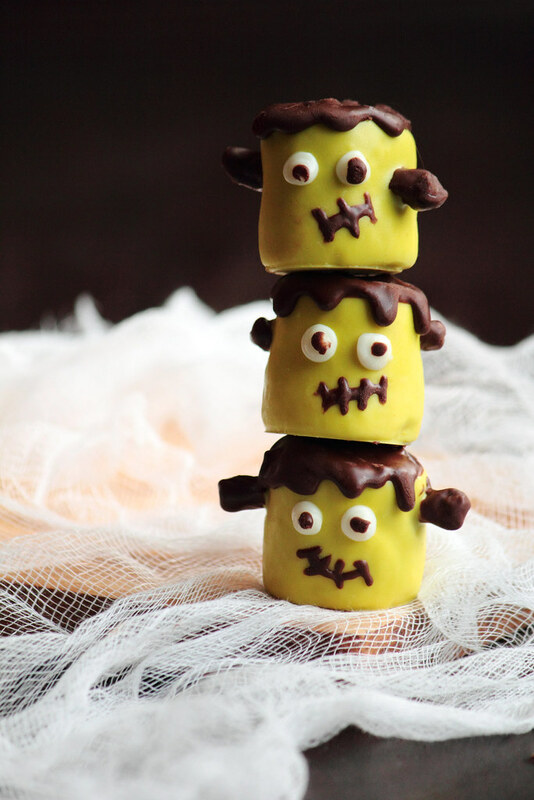 These Frankenstein Marshmallow Pops are easy to make and even more fun to eat. 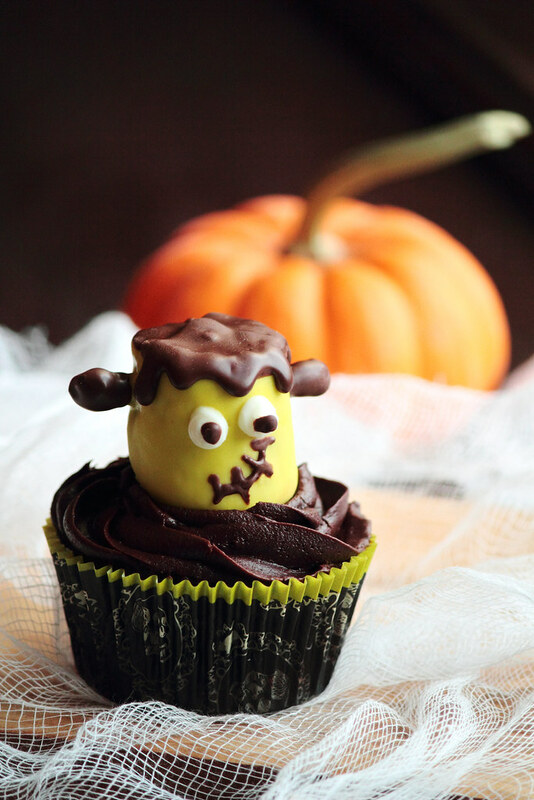 Perfect as a Halloween treat, these little monsters can be placed on top of cakes, cupcakes, cookies, or left to speak for themselves. 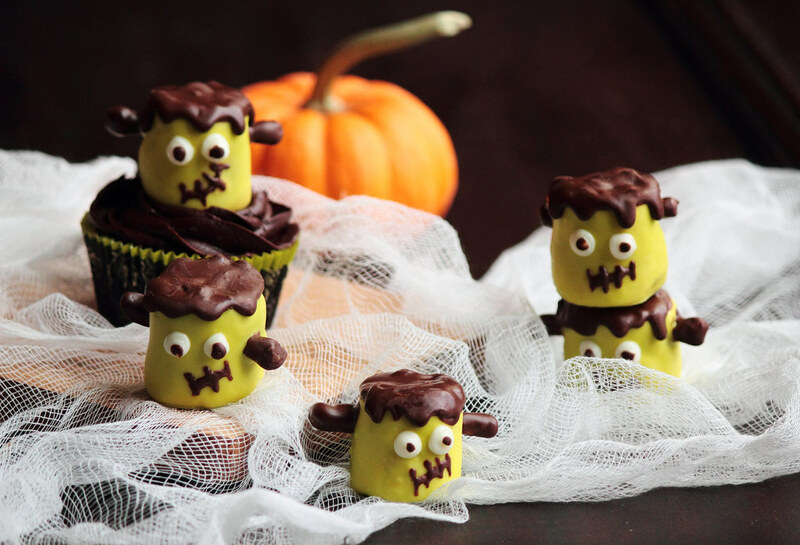 A few ingredients is all it takes to produce these marshmallow Frankensteins (plus, they taste pretty sweet, too). 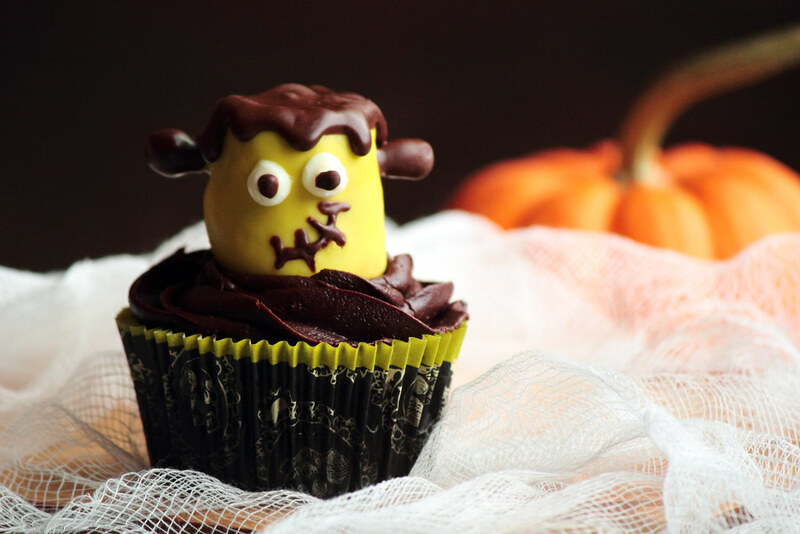 These would make a spooky addition to your Halloween treat bag. This is my first year celebrating a Canadian Thanksgiving. At the beginning of October, the timing feels wrong, but the fall flavors feel right. Canadian Thanksgiving isn't a romantic idealism about Pilgrims and Indians breaking bread together for the first time. It's about celebrating the autumn harvest. But let's be real, no matter which country you are in, Thanksgiving is all about the food. Today, I am thankful that this pumpkin bread pudding was not a complete disaster. 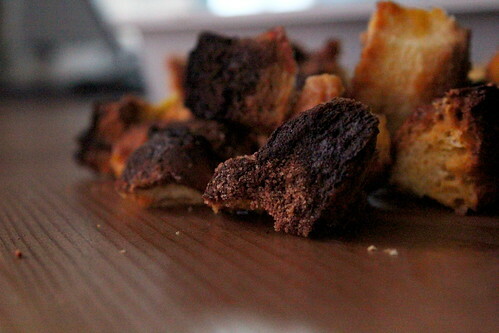 My bread pudding finished cooking ten minutes before it should have, burning the top layer of bread. The first time I made the caramel, the sugar seized up about halfway through, turning it into a giant, impenetrable sugar cube of failure. I added more water to compensate which seemed wise at the time, but really just made the caramel much too runny. So, I dumped it down the drain, sat next to my charred bread pudding and sighed. My thanksgiving party was in less than an hour and my dessert was in a sad state of affairs. But self pity wasn't going to feed anyone, so I set off to salvage what I could. I picked off the burnt layer of bread and made another batch of caramel. This time, everything came together just right. And just in time to grab it and run out the door. 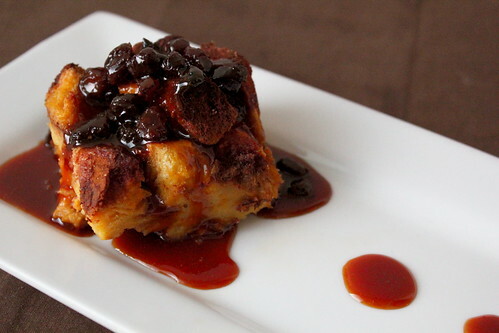 At the end of the day, my drama over this bread pudding seems trivial. After an evening spent in good company, my stomach is full and my eyes are heavy. The outcome of one component of the meal was not going to make or break the evening. Thanksgiving is a time for togetherness, whether you are sharing the holiday with family you love or friends you have just met. Having moved to Montreal a month ago, being surrounded by a new family of friends is something I am truly thankful for. 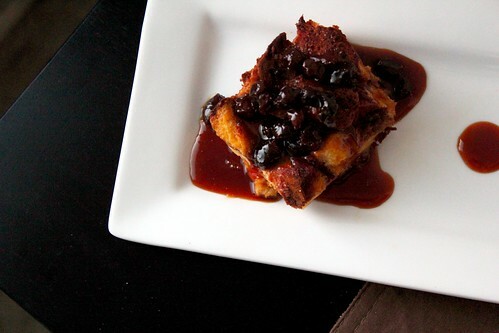 And, just for the record, this bread pudding was an absolute hit. Every bite was cleanly eaten from the plates. 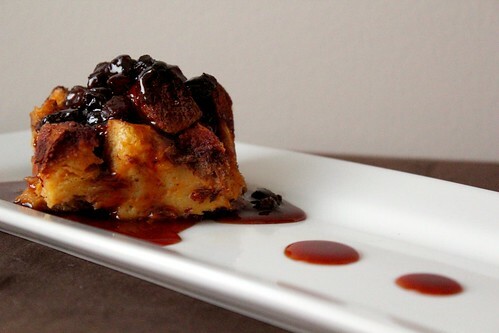 The pudding itself is moist with a mild pumpkin flavor, but the caramel rum raisin sauce really sets this bread pudding apart. 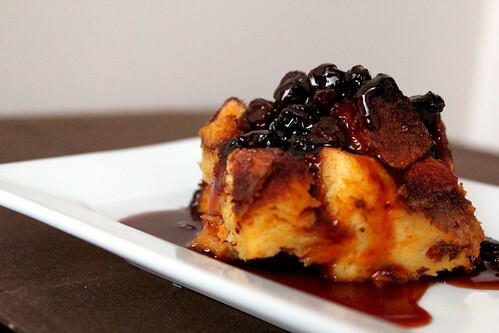 The caramel compliments the pumpkin in the bread pudding and the rum soaked raisins add just the right amount of alcoholic flair. This dessert is truly decadent. It serves well at dinner parties or Thanksgiving meals (yes, I am looking at you, fellow Americans).